During his first year and half in office, Agriculture Commissioner Sid Miller's conduct has ranged from the cartoonish to the potentially criminal. 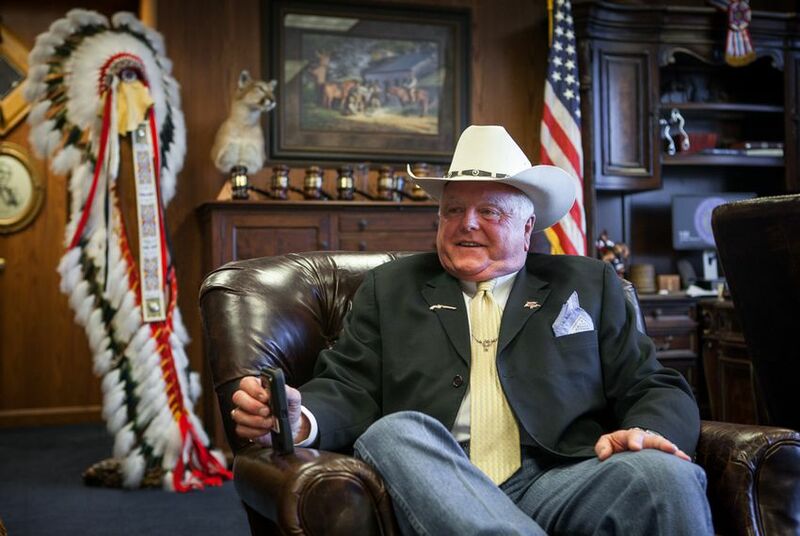 Shortly before Sid Miller was sworn into office, the newly elected Texas agriculture chief was asked at a conservative policy forum what keeps him up at night. “Bad Mexican food,” he said. A 60-year-old champion calf roper, landscape nursery owner and former state legislator with a ruddy, weathered complexion and teeth as bright as his seldom-missing white cowboy hat, Miller is now almost a year and a half into his four-year term as agriculture commissioner. And as he becomes entangled in an increasingly long list of controversies, he may be having a little more difficulty falling asleep. Miller’s conduct in office has ranged from the cartoonish — revamping inspection stickers for the state’s more than 170,000 fuel pumps to more prominently feature his name — to the potentially criminal — allegedly bankrolling two out-of-state trips with public funds to receive what’s known as a “Jesus Shot” and to compete in a rodeo. Perhaps most troubling for his political prospects, the Stephenville Republican who campaigned on his fiscal conservatism has veered wildly off-script. He has expanded the department's top paid positions, doled out more bonuses than any other statewide official and dramatically hiked fees for many of the industries and agricultural interests his agency regulates. Miller has actively courted some of the attention. His widely publicized first official act as commissioner was granting “amnesty” to cupcakes in Texas public schools (cupcakes in schools were already legal, but what the heck), a move followed by lifting a ban on deep fryers and soda machines on their campuses. He seems to delight in posting, then defending ill-advised musings on social media (see this one from August 2015 suggesting the United States nuke the Muslim world, or this one from November 2015 comparing Syrian refugees to rattlesnakes). But the spotlight has also brought more scrutiny to Miller as he transitions from the Texas House seat he held for 12 years to the larger state stage where every Texan is now a constituent. And there may be more serious problems on the horizon. The Texas Rangers are currently investigating whether Miller broke the law when he took those out-of-state, taxpayer-funded trips in February 2015. The first was to Oklahoma, where internal emails from the Department of Agriculture indicated he planned the trip solely to obtain the Jesus Shot, which some believe cures all pain for life. Miller, who claimed the trip’s intent was to meet with Oklahoma lawmakers, said he would repay the state for the trip out of an "abundance of caution" after it was revealed in March by the Houston Chronicle that he missed a meeting with the state agriculture commissioner, Jim Reese. “There was an official purpose for him to be in Oklahoma, and that was to meet with the commissioner of the state of Oklahoma,” insisted Todd Smith, Miller's political consultant of 17 years, on Thursday. Smith attributed the missed meeting to a “comedy of errors.” He could not answer why those issues were not discussed at a conference both Reese and Miller attended just days before the so-called Jesus Shot trip. Miller also traveled to Mississippi on the state's dime, where he participated in the National Dixie Rodeo. When asked about the trip, the Department of Agriculture provided more than one version of how it came to pass, and late Thursday, Smith offered a much different account than his boss. Initially, the Houston Chronicle reported that Miller took the state-paid trip to Mississippi to participate in the National Dixie Rodeo but sometime after that tried to set up a work meeting with the Magnolia State’s agriculture officials, making it a legitimate state-covered business trip. Miller said after those meetings fell through, he repaid the state for the trip with campaign funds because he also met with donors and advisers. More than a week before the Chronicle story, Miller's then-communications director Lucy Nashed told The Texas Tribune that the Mississippi trip — which was always designed to be a personal trip — was mistakenly booked by a staffer as a business trip. Once the staffer realized the trip was personal, Nashed said, Miller repaid the state for the trip out of campaign funds and $16.79 from his nursery’s business account. Earlier this month, Nashed resigned, saying there was a “tremendous lack of communication” at the department. “There’s nothing absolutely illegal or wrong with either of those trips," he said. But on Thursday, Miller’s political consultant told the Tribune a new version of the Mississippi trip. He said it was always supposed to be a business trip to meet with Agriculture Commissioner Cindy Hyde-Smith and that those meetings did occur, contrary to what his boss has previously said. Tribune attempts to confirm whether Mississippi officials met with Miller have been unsuccessful. As for Miller’s rodeo-ing while on a state-paid trip, Smith said there was nothing wrong with it and compared it to buying souvenirs while on a business trip. “He can't flip a switch and say, 'I'm no longer the agriculture commissioner here, and I'm the agricultural commissioner now,'” Smith said. Miller, who had hip surgery this week in Fort Worth, was not available for an interview. Last week, his staff said he was on medical leave. And the week before that, the Tribune was told the commissioner’s schedule was too full to allow one. Even before the Texas Rangers entered the scene, Miller’s time in statewide office was off to a rocky start. In a bitter, five-way Republican primary brawl, he battled ethics complaints over a transfer of stocks purchased with campaign funds to his personal account to repay a loan, with interest, he had made to the campaign. It’s not clear to this day if any profits have been reported on Miller’s tax returns. Miller also had to fend off criticism of his volunteer campaign manager, rocker and hunting enthusiast Ted Nugent. The former lawmaker asked Nugent to join his campaign after developing a friendship while promoting legislation Miller passed in 2011 allowing the hunting of feral hogs from helicopters, known as the “pork chopper” bill. But Miller, who also successfully carried legislation requiring doctors to show women sonograms before they obtain abortions, ultimately won with the heavy support of social conservatives. During Miller’s first few months in office, he clashed with his former colleagues in the Texas House after asking for an almost $50 million boost in state revenue for his department, saying “consumers [were] getting screwed” because it didn’t have the money to perform its regulatory duties. “I have never seen an expansion of government and a growth in government so quickly from a new administration,” said state Rep. Larry Gonzales, the Round Rock Republican who oversees the agency’s budget, at the time. Over the objections of agriculture and industry groups — and many other elected officials, including Lt. Gov. Dan Patrick — Miller then raised the department's fees for a wide variety of licenses, registrations and services it provides across the state. Noticeably saved from the fee hikes are those in Miller’s own industry: nursery and floral businesses, which pay between $75 and $180 a year for state certifications. Miller laid the blame for the fee hikes on lawmakers, who did not restore huge cuts to the agency's budget made in 2011, which Miller himself voted for as a state representative. As he was battling for more money from the state, the ag chief was also making other big changes. He created four new assistant commissioner positions, each with annual salaries of more than $180,000, making them among the highest-paid employees at the agency. The new faces included campaign adviser Walt Roberts, a fiddler, actor, and former Oklahoma state lawmaker who pleaded guilty to federal felony and misdemeanor charges related to campaign finance abuses in 2003. Another job went to Kellie Housewright-Smith, a stay-at-home mother with a nursing degree who is the wife of Miller’s longtime political consultant, Todd Smith. The hire came as the couple was preparing to file for Chapter 7 bankruptcy. According to their bankruptcy file, the Smiths had completed a credit counseling course required by the federal Western District of Texas court in Austin on Nov. 24, 2014, about two weeks after Miller was elected and about a week after she was initially hired by Miller. Smith said Miller hired his wife directly because of her experience as a health care consultant to former congressman Greg Laughlin and current U.S. Rep. Joe Barton. They filed for bankruptcy the following February, and a month later, Housewright-Smith was dismissed. Documents obtained by the Tribune show she was on probation for chronic absenteeism. Smith said his wife quit to spend more time taking care of their son, who has medical needs. So far, the agriculture chief’s top backers have greeted his mounting woes with silence. Steve Hotze, the Houston doctor who operates Conservative Republicans of Texas, a powerful political action committee that helped propel Miller to victory, did not respond to a request for comment for this story. Neither did Michael Quinn Sullivan, the president of the fiscal conservative advocacy group Empower Texans, which also championed Miller. Other Republicans officials have largely kept mum, except for Abbott, who said through a spokesman he believed “allegations of misuse of taxpayer dollars warrant a thorough investigation” shortly after news of the Texas Rangers’ involvement broke. Smith, however, remained buoyant about his client’s future in politics. "I think Commissioner Miller has great confidence in the wisdom and the objectivity of the people of Texas," he said. "And I think the people of Texas can see some of the attacks made against Commissioner Miller for what they are: politically motivated. He understands politics as a rough and tumble sport."